The first step of the REM process is to put your opponents on a range of hands. In this article, I am going to show you how to assign ranges of hands to your opponent using stats and reads. Preflop hand ranges - the easy bit. Post flop hand ranges - the trickier bit. Remember that your objective with hand reading is to put your opponent on a range of hands, not two exact cards. The best way to assign a hand range to your opponent is to use the immensely useful HUD stats from tracking programs like Poker Tracker 3 and HoldemManager. You can estimate a fairly accurate range based on knowledge of your opponent alone without any stats, but to teach that ability is out of the scope of this article, and using stats makes things a hell of a lot easier. So get HoldemManager and make your life easier. Stats are great for pin-pointing ranges. VPIP (VP) - Voluntarily Put $ In Pot. This is the total % of times the player will enter the pot preflop by calling or raising. This is the % of times the player will enter a pot preflop by raising. Plays 24% of all hands that they are dealt. Raises with 16% of all hands that they are dealt. Rough guide to hand ranges based on HUD stats. 5% = "pairs 77+, AK, AQs" or "pairs 99+, AK, AQ." 10% = "pairs 66+, AK, AQ, suited aces, KQs, QJs"
15% = "any pair, AK, AQ, KQ, suited connectors 54+, any suited ace"
20% = "any pair, any two broadway, any suited ace"
25% = "any pair, any suited broadway, any ace, any suited connectors 54s+, KQo"
30% = "any pair, any ace, any suited king, any suited broadway, any suited connectors 54s+, KTo+, QJo" or "any pair, any ace, any suited king, any broadway"
40% = "any pair, any ace, any king, any two broadway, any suited connectors 32s+"
50% = "any pair, any two suited cards, any ace, any two broadway, K5o+"
VPIP: 24% - Is entering the pot with any pair, any suited broadway, any ace and any suited connectors. PFR: 16% - Is raising before the flop with any pair, AK, AQ, KQ, suited connectors 54+ and any suited ace. Thanks to these stats, we now have a very good idea of the sort of hands that our opponent will enter a pot with and more specifically, what sort of hands they will be open raising with. As we play through a hand with them we can whittle this range down even further by analyzing how our opponent plays the flop, turn and river. 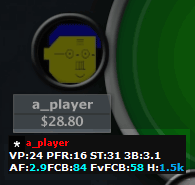 These VPIP and PFR stats are also covered in the Holdem Manager HUD tutorial and HUD Ninja videos. What is my opponent has stats like VPIP: 40 / PFR: 30? Then so be it - they have a wide range of hands that they will enter pots and raise with. Don't be phased by the fact you can't put them on a super-specific range before the flop. It just means that they are loose and you shouldn't give them credit for premium holdings too often. Sure, we can't get a real specific range, but we still know what sort of hands we can include in their range, so don't be surprised when they turn up with a hand like 34 offsuit at a showdown. Adjust your preflop play accordingly and use the flop, turn and river betting rounds to try and best work out what sort of hand they might be holding. This is where it gets trickier. Using our preflop hand range as a base, our aim is to now refine that range as much as possible. The more we (safely) reduce our opponent's range, the more information we will have in the hand and the more +EV our plays will be. However, whittling down our opponents hand range post flop isn't going to be quite as easy as it was to look at a bunch of stats like we did before the flop. It would be great if I could tell you to "do this" and "do that" to figure out exactly what your opponent is holding, but that's just not how poker works I'm afraid. However, I can give you a few tips to help you reduce that range. Question every play and put yourself in your opponent's shoes. Why would my opponent check on this flop? Why would my opponent bet on this flop? Why would my opponent raise on this flop? Now do that for every betting round. The better you can answer those questions, the easier it will be to reduce your opponent's range and form a more complete picture of the hand. If you want to get really good at assigning hand ranges (why wouldn't you? ), watch the Where The Buffalo Roam video series at DeucesCracked. This is the absolute best way to learn this particular skill. Of course, that's a lot easier said than done, but who said poker is easy? Poker is a thinking man's game, so put your brain to good use and always aim to try and figure out why your opponent is playing the way they are. If you can figure out why your opponent is making their plays, you can figure out what they are likely to be holding. It's a pretty non-specific strategy I know, but this is where practice comes in to play. I can't teach you how to read hands like a champ in one article (probably not even in 5 or 6 articles for that matter), so get out there and play some poker. Evaluation of "range" in the REM process. I'm sure that a lot of you were impressed with how easy it was to assign a hand range to your opponent's preflop, but then quietly disappointed with the "use your head" approach for post flop hand ranges. HoldemManager stats can help with post flop hand ranges, but then that would make this article longer than my manhood. The bulk of useful information is going to come from your experience and knowledge anyway when it comes to post flop hand ranges. A great follow on article from this is "putting players on a hand", which is quite long but is a great supplement to this hand reading and range article. Next stop, The REM Process - Equity.